The United States Mint has released images of the new 5-ounce America the Beautiful Silver Bullion Coins and they are gorgeous. 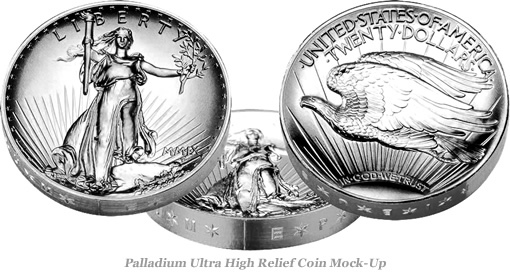 The designs are legislated to be nearly identical to the new quarters, except that they are a full three inches in diameter, making them large (and thin). These are the first five ounce bullion coins produced by the US Mint, and are not going to be sold directly from the US Mint website. This, of course, means that collectors are going to have to pay an unnecessary markup from dealers to get them. Silver is now trading at over $21 / ounce, so expect each coin to be at least $110. 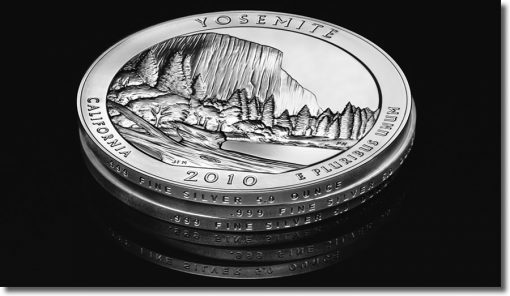 They are making one for each of the new quarters – five in all. They are minting 500,000 total – 100,000 each. I expect these to sell out quickly due to their unique design, size, and limited mintage. $110 might seem expensive for a coin, but compared to escalating gold prices, silver arbitrarily seems “affordable”. The Best Hedge for Crisis: Gold, Dollar or Both? What is the best hedge for a crisis? The last two years have validated the fundamental premise of The Black Swan theory. That premise is that, due to incomplete information and faulty statistical assumptions, the market generally underprices risk at the “tails” of the distribution. In other words, while the outcomes of the market tend to look like a normal distribution, in reality, more “rare” events happen than would be predicted mathematically. Given a potential fear of crisis, what is the best way to hedge? What’s the best way to have some fundamental security in the face of these events? For Nassim Taleb, the author, he has made his investment approach well known. He keeps the vast majority of his money in cash, and periodically invests a small percentage in out-of-the-money puts on the market. In 2008, this made for extremely high returns (between 65% and 115%). Unfortunately, this is such an extreme approach, it’s hard to recommend it as a general practice for anyone but the most stalwart intellectual and contrarian. If you read any financial press, or listen to AM radio, you likely have heard a much more common refrain about a hedge against crists: Gold. Gold has historically been pitched as the ultimate hedge against inflation and crisis. You can literally find websites that explain how to not only buy gold bullion, but how to effectively bury it in your yard in such a way that it won’t come up on satellite photos (in case the US Government chooses to confiscate it again, like FDR did in 1933.) I’m not kidding. Because fascination with gold goes back basically as long as recorded history, it’s rare to find new information on the topic. This article in Seeking Alpha, however, caught my eye, as a rare piece that had something new to say about investing in Gold. This article highlights a well known point – that recently, when the market collapsed, gold actually collapsed with it. In fact, if you look at the charts, in the past decade, gold and the market look like their moving together. This makes it a terrible hedge, because good hedges are supposed to be decoupled. In truth, GLD does appear to be a venerable contender for a portion of a well-diversified portfolio. Yet in a “black swan/perfect storm catastrophe” like the 3 month, systemic breakdown of 2008 (September through November), GLD dropped an astonishing -30%. PowerShares DB U.S. Dollar Bullish (UUP) soared 20%. What’s interesting, however, is that in these periods, a very surprising asset has done well: The US Dollar. The author goes on to advocate for a split between the US Dollar Bullish ETF and Gold. The insight here is not that you should split your “crisis” holdings between Gold and the Dollar. Most Americans are already heavily weighted in dollar holdings. The insight is simply that gold actually doesn’t cover you in all crises, despite the protestations of the gold bugs. A reciprocal trade where you sell into strength of one, and buy the other? Relationships between various mixes of gold & dollar to hedge a stock portfolio? My guess is that a dollar-denominated fixed income allocation (Treasuries) would look similar to dollar bullish, and would fit a more traditional view of asset allocation. The US Mint has announced that the 2009 Ultra High Relief Double Eagle Gold Coin will go on sale at 12:00pm EST on Thursday, 1/22. It’s unclear what demand for this coin will look like, given its price. (Likely $1200). This announcement reflects the new US Mint pricing strategy for precious metals – basically a premium over market price, in buckets. Still, gold coins continue to exhibit considerable demand, and this is an extremely flattering classicly-designed piece. You can read more about the coin here on my blog, or here on the US Mint website. 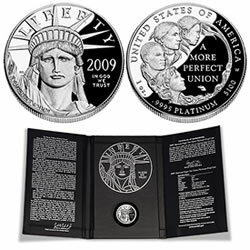 Update (1/20/2009): Found this product page today on US Mint website. Price is $1189.00, and delivery might take 6-9 months! Limit one per household. Talk about delayed gratification.